A ominous new teaser for Broadchurch series 3 has debuted on Twitter. The video, which features the cliffs of West Bay on Dorset’s Jurassic Coast, also revealed a return date for the thriller: February 2017. 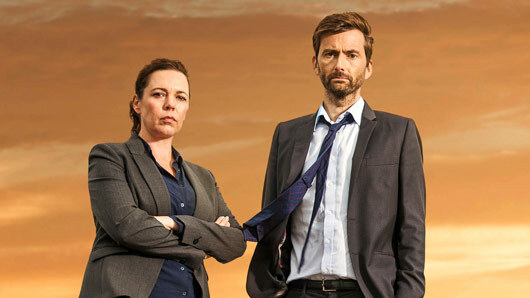 Series three of the popular crime-drama will see David Tennant and Olivia Colman reprise their roles as Detective Inspector Alec Hardy and Detective Sergeant Ellie Miller. The thrilling finale of series two saw Ellie’s former husband Joe Miller found not guilty of the murder of Danny Latimer, the child whose murder investigation was the focal point of series one. Series three will reportedly see Ellie and Alec investigate a sexual assault in the small town of Broadchurch. Broadchurch returns in February 2017. « WATCH: Sherlock is excited for Baby Watson in new Sherlock series 4 BTS featurette!